Fabulous food & drink & view &……me play guitar and sing me songs! Country-rock and western swing standards and originals with Andrew and Kirsten London…a bit of satire , comedy and social comment if the vibe is right. Andrew & Kirsten with guests James Tait-Jamieson (sax, flute, melodica) and Wayne Mason (keys). 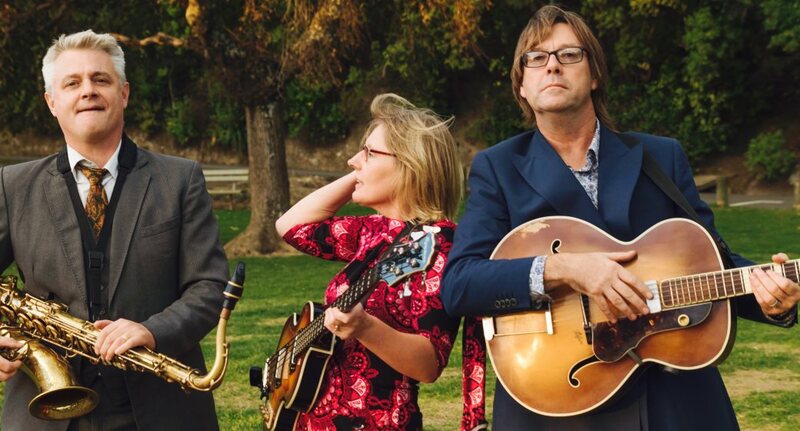 Original songs of a whimsical and satirical nature, with elements of swing, jazz & ragtime, mostly culled from Andrew’s last four albums, nine Hot Club Sandwich albums and a couple of Cattlestops records. And maybe some standards. Extra swingy tonight, with James Cameron, Andrew London and ??????? Sit back with a craft beer and while away a few hours at Waikanae Beach’s Longbeach Cafe.